The Masters, one of the four majors of golf which concluded over the weekend had some surprises in store this year. Tiger Woods was in the spotlight after returning to the Masters after 3 years and Patrick Reed beat all the favorites to win the title in 2018. For a sponsor, the most distinguishing factor of the Masters is its art of minimal sponsorship. It has only six sponsors — Rolex, Mercedes Benz, IBM, AT&T, UPS and Delta Airlines, the lowest for a well-known and major tournament. These sponsors pay upwards of $6 million to be a part of this event and have to abide by certain rules of promotion, chief among them being no sponsor signage on the lawns and a combined broadcast time of 4 minutes per hour. It is a less crowded sponsorship field, albeit a more challenging one. However, as with any major sporting event the title sponsors are not the only brand sponsors in the limelight. Brands from categories such as Automobiles, Banks, Insurance, Apparel and Equipment are other significant sponsor categories in golf. These peripheral brands are ever present in any golfing event and generate value equal to or more than the event sponsors. 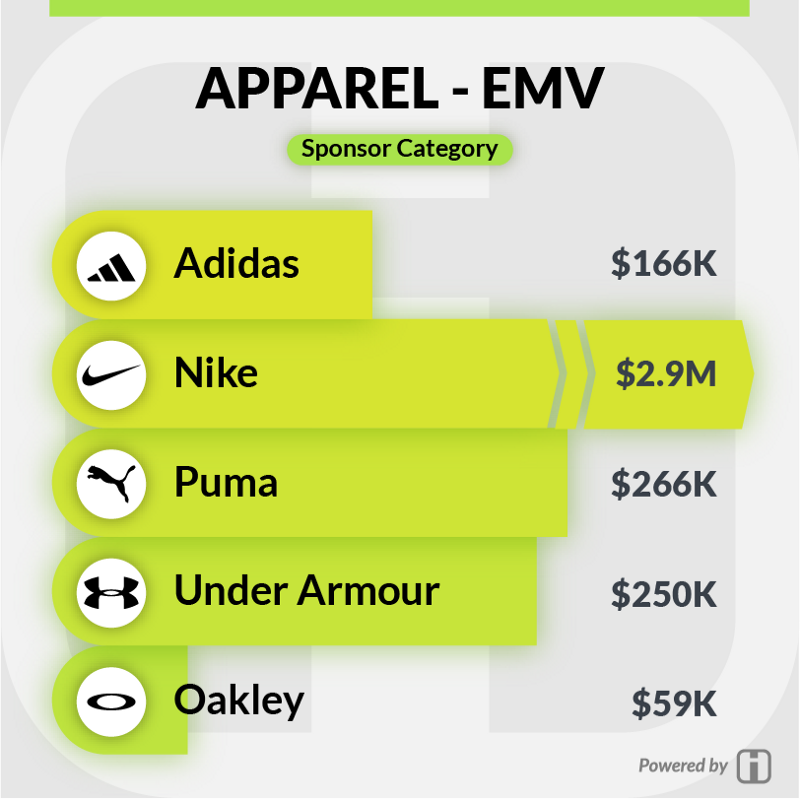 Hookit analyzed these peripheral brands to understand the earned media value (EMV) generated from social media in 2018. The individual sponsors of: the top 10 players at the Masters, 2017 Masters winner Sergio Garcia, four time Masters winner Tiger Woods, 2018 PGA Tournament winners and the top 10 highest earners of golf in 2018 were considered for this analysis (a total of 23 players). The earned media value generated by each brand was then calculated as the sum of value generated from each of its sponsored athletes promotion on social media. Time period considered was January 1, 2018 to April 9, 2018. Callaway, TaylorMade, Ping, Cobra and Titleist were the major equipment sponsors for the players used in the analysis. 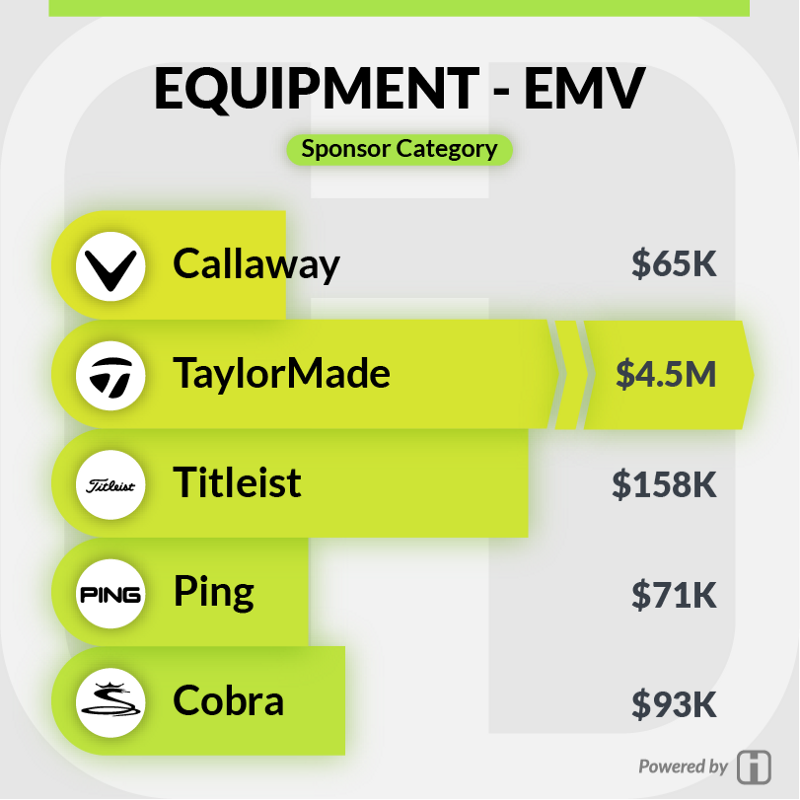 Among these 5 sponsors, TaylorMade generated an earned media value of $4.5M on social media in 2018, which is 12.5 times more than the other 4 sponsors COMBINED. The major contributor to the EMV was Irish golfer Rory McIlroy whose consistent promotion of TaylorMade on his social channels contributed to $3.1M in media value. Another notable sponsor is Cobra-Puma who earned a media value of $93k on social media through its sponsorship of American golfer Rickie Fowler. Most of the top golfers are outfitted by these 4 brands with the exception of Bubba Watson who has a sponsorship from Oakley. During 2018, Nike generated an earned media value of $2.9M from its sponsored athlete promotions on social media. This value was 4 times more than the other apparel brands COMBINED. Again, Rory McIlroy was the primary driver of social media value for Nike — his social posts generated $2.6M, which is 90% of the total value generated for Nike during this period. The other top sponsored athletes of Nike, Patrick Reed and Tiger Woods generated $11k and $234k value for Nike respectively. 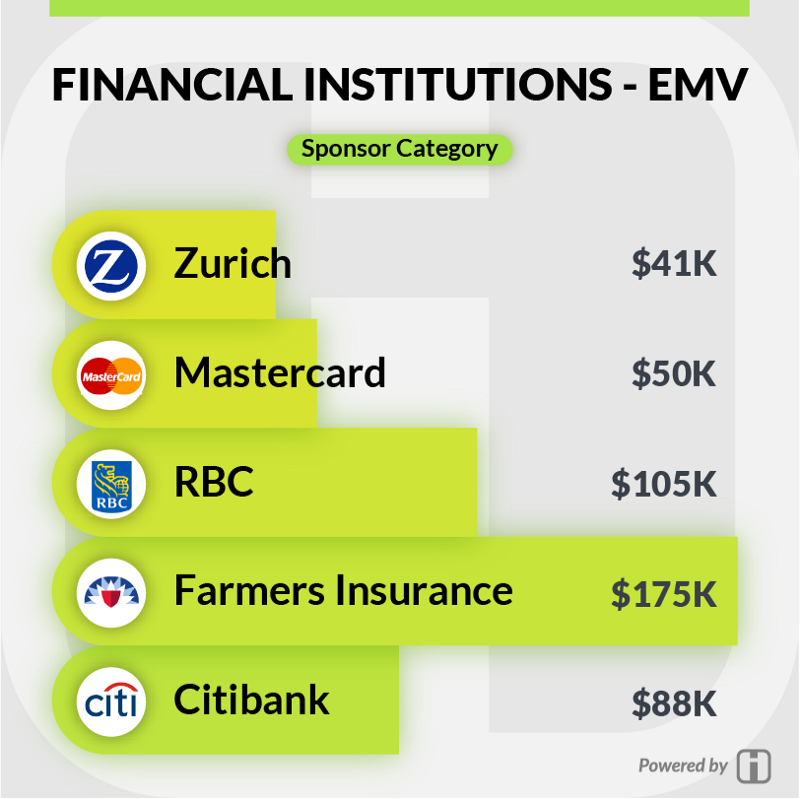 Another large category of sponsorships for Golf players are Banks and Insurance. Financial institutions also sponsor many major PGA tournaments in markets where they have significant target audiences. American insurance group Farmers Insurance earned a media value of $175k from social media posts by sponsored athlete Rickie Fowler while The Royal Bank of Canada earned $105k media value from social media posts of Dustin Johnson. Among the 23 athletes used in this analysis, luxury watchmaker Rolex sponsors 6 players, while Hublot sponsors 3 players and Omega sponsors 2 players. Of these three sponsors, Omega earned the most media value of $536k from its sponsored athletes while Rolex and Hublot earned less than 9% of the earned media value of Omega from their sponsored athletes. Rory McIlroy generated the most earned media value for his sponsors — his social media promotions of sponsors Nike, Omega and TaylorMade generated a combined media value of $6.2M for his sponsors. 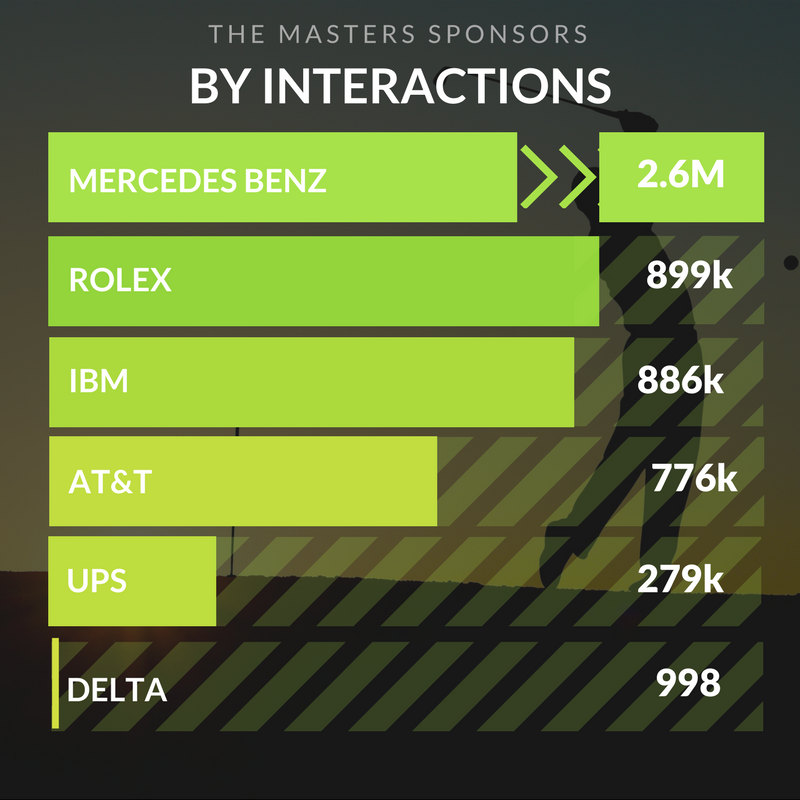 With 2.6M interactions across its social channels, Mercedes Benz had the most interactions among the six title sponsors of the Masters, followed by Rolex with 899k social interactions. After his win at the Masters, Patrick Reed had an increase in social media interactions by 190% while his follower count grew by 16%. In comparison, second place winner Rickie Fowler’s follower growth was only 0.7%. The hashtag #TheMasters was used 116k times and had 30M interactions — 82% of these interactions were on Twitter. Sponsored athletes are a great way for brands and sponsors to earn media value from social media platforms. Consistent promotion and engagement with fans on social media by sponsored athletes can drive higher earned media value and greater return on ROI for sponsors. 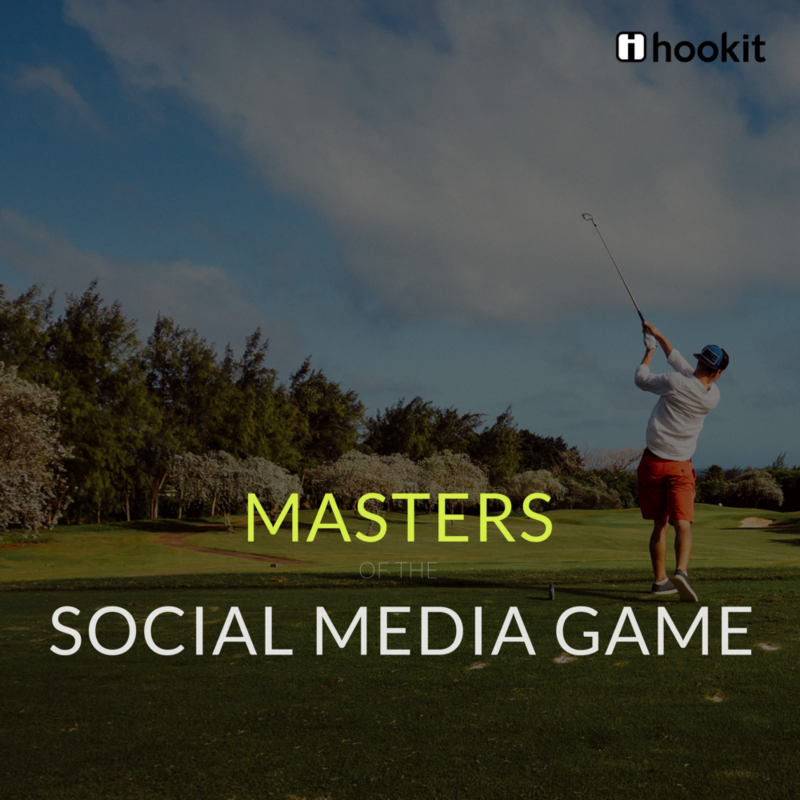 TaylorMade and Nike can be construed as a great examples of how lesser publicized brand sponsors can consistently and gradually build their social presence and media value behind the scenes and emerge as champions of the sponsorship game.